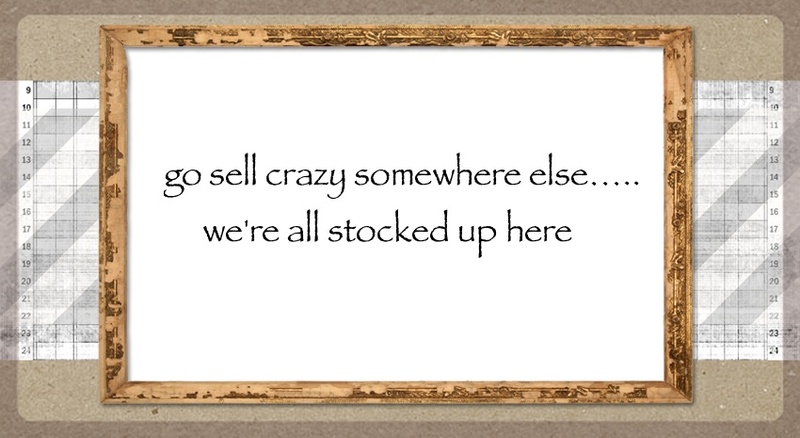 go sell crazy somewhere else: CAN'T YOU JUST LEAVE IT ALONE???? Was the direct quote from my daughter. What you may ask, was she referring to??? The house. We are ALWAYS in some sort of project here. If you recall, we redid the kitchen floor a month or so ago, and it looks so fabulous, that the rest of the floors in the house look really shabby. And not shabby chic, shabby... shabby-ick. So we are moving on into the dining room and doing that floor next. Now, the dining room has a large closet in it- walk in style ala old house. Really almost a small room. Up to this point it housed coats, vacuum, hats, gloves, afghans, purses.. you know, coat closet type stuff. It was kind of a mess, no, really a mess. We pulled out all the contents and threw out a ton of stuff. So my husband, never to do anything 1/2 way is redoing the closet too. 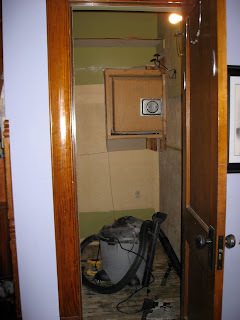 Ah, then there was the closet floor...It had nasty old linoleum on it. The old school kind with a black paper back that doesn't come up very easy when it's been stuck for 50+ years to the wood...you know. OMG......I'm with your daughter! But it will look wonderful when done! Hey...did you pick your OWOH winner yet?